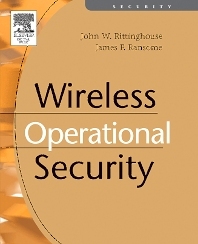 This comprehensive wireless network book addresses the operational and day-to-day security management requirements of 21st century companies. Wireless networks can easily be reconfigured, are very mobile, allow for potentially nonstop exposure, and require the level of security be scrutinized even more than for wired networks. This includes inherent security flaws in various wireless architectures that result in additional risks to otherwise secure converged wired networks. An even worse scenario is one where an insecure wireless network is connected to a weakly secured or insecure wired network and the wireless subnet is not separated from the wired subnet. There are approximately a dozen popular books that cover components of the architecture, design, theory, issues, challenges, and recommended policies for wireless security, none of which address them in a practical, operationally-oriented and comprehensive way. Wireless Operational Security bridges this gap. John has over 25 years experience in the IT and security sector. He is an often sought management consultant for large enterprise and is currently a member of the Federal Communication Commission's Homeland Security Network Reliabiltiy and Interoperability Council Focus Group on Cybersecurity, working in the Voice over Internet Protocol workgroup. James F. Ransome, Ph.D., CISSP, CISM, has over 30 years experience in security operations and technology assessment as a corporate security executive and positions within the intelligence, DoD, and federal law enforcement communities. He has a Ph.D. in information systems specializing in information security and is a member of Upsilon Pi Epsilon (UPE), the International Honor Society for the Computing and Information Disciplines. He is currently Vice President of Integrated Information Security at CH2M HILL in Denver, CO.